Ugh! I know what you mean. It can happen so quickly… one minute joy and a millisecond later it’s like World War III (I might exaggerate slightly). You mean like one minute they are sweetly building a farm with all their animals and the next moment …. The animals become flying projectiles?! Same exact thing happens here. Next thing I know there is a full-on wrestling (or screaming) match. Why does that always seem to happen?! Your guess is as good as mine. But it is a lot of work to be the conflict negotiator! Not a role I imagined when I thought about being a mom. And it’s one that is pretty important in the whole scheme of training our children in the way they should go. And it gives us a lot of opportunities to talk about choosing to love one another and not hate each other. That’s very true. And I guess my kids aren’t so different from myself, huh? My first inclination is to fight for what I want, when I want it. It takes some training and practice to choose to love and consider someone else’s perspective. You have to want to see it another way first. And that is so hard to do myself let alone to teach. I want my kids to really be on the same team in the long run. There’s so much out in the world that they will need to rely on each other for. Right! So, how do I go about trying to teach them to look out for each other? They definitely will face situations their whole lives where they have to work out conflicts. Maybe what they are doing now with their siblings is preparing them for adulthood?? And then when “little” David (maybe a teenager) shows up to bring his big brothers food on the front lines of battle and then that little pipsqueak of a brother not only fights the giant Goliath, but kills him in the name of the God of Israel?! The Bible doesn’t say, but I wonder if that changed the hearts of his brothers? Made them see David in a new light? I’ve never thought about that before! Can we help our kids to see each other in that new light? To help them use these sibling squabbles to really learn who God made the others ones to be? So they can see how each of their siblings has unique gifts – and when they all work together, they can make a great team! Yes!! They could be such a force for peace in the world when they work together. I know this seems like crazy talk when I can practically hear them fighting in my sleep. Do you think there’s hope? There has to be!! I think our kids are sloooowly learning how to be a team. How to communicate, how to forgive, how to cooperate. And, maybe, what they are learning about bringing peace to their tiny corner of the world right now will translate into being grown-ups who look for opportunities to spread peace, too. 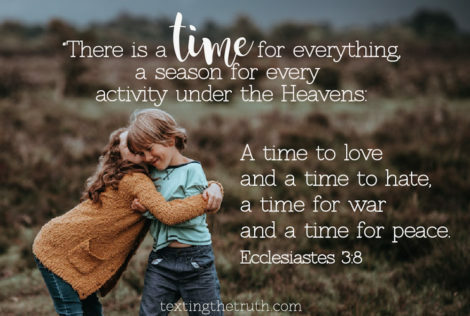 So what you’re saying is that though we may be in a season of “hate” and “war” now, we are preparing them to live their lives in a season of “love” for others and in “peace” with those around them? That makes the title of conflict negotiator seem a great honor and privilege. Yes, it does! I can’t think of any higher honor! Oh, I think I hear someone screaming!😳 Time for me to play the negotiator again – but with some renewed hope and purpose! Read the story of David in 1 Samuel 16-17. 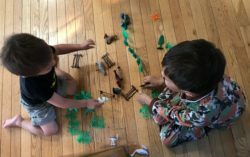 Encouraging Siblings to Get Along This article from Focus on the Family has some great practical strategies. Check out the author’s idea to use tickets to minimize tattling between siblings! Sibling Cooperation Great ideas from different parents about how to encourage positive sibling relationships. Pray for a new perspective on the skills God is sharpening in your children through the sibling rivalry conflicts. Ask God to help you in your role as conflict negotiator to train your children how to disagree and then resolve conflict. Especially pray for yourself or find another mom who could pray with and for each other about seeing with new eyes the reason your children argue, fight, disagree. Ask God to show you how to train them because it’s probably different for each family. 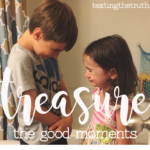 I (Katie) have found that my kids get along best when we carve out extended time to just be together as a family without a schedule or agenda. Conversation during family meal times and playing outside have been important for relationship-building in our family. And we love board games. I feel like they give just enough structure to help everyone participate and have fun, while minimizing the arguing. Find out what works best to help your children connect with each other (it can be different for every family!). Be intentional about making time for those activities. NFL Rush Zone A perfect board game for football-obsessed, elementary age kids!. Sequence for Kids One of our favorite games because all our kids (ages 2-8) can have fun playing it together.